We love flowers as much as you do! Also, just like you, we want to keep your floral arrangements looking fabulous for as long as possible. Thankfully, caring for fresh flowers is an easy job. As professional florists, here are our top tips on how to care for your cut flowers. One of the best ways of caring for fresh flowers is to keep the water fresh. Changing the water at least every two days helps prevent bacteria growth, which causes flowers to deteriorate quickly. When you change your water, spend a few moments to remove the flowers which are dead or dying. Clean the container they are in, if possible, with soapy water and rinse well. This also removes any bacterial growth. Use a knife to cut the stems, as scissors can crush the flower’s stem and stop it absorbing water. A quick search on the internet will show you many different opinions on caring for fresh flowers. Some suggest adding bleach to their water, others sugar and even aspirin. While I do have sachets of flower food available, I believe the best flower food is fresh water with nothing added to it. Bacteria is one of the major causes of cut flowers having a short lifespan. You can counter this by only using clean vases, emptying the old water and replacing with fresh water every two days, and removing flowers and foliage which has perished. The next time you need a florist in the Kaitaia, Northland area, come see us! 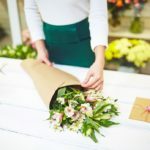 As your local florist, we can help you with bouquets for any occasion your wedding or anniversary, as well as events like Valentine’s Day and Mother’s Day. Remember though, fresh flowers are not just for special occasions – they’re for everyday too! Take a browse through our online florist shop today.